Where I’m from, the only places open on Christmas Eve and Christmas Day are churches, movie theaters and Chinese restaurants. My upbringing in suburban New England has foolishly duped me into thinking this fact is a universal truth; that Macy’s and Saks Fifth Avenue must close as to not disrupt Kris Kringle on his circumterrestrial route and that there is simply nothing else to do on December 24th and 25th other than stay in, absorb your caloric intake for the week in mere hours, and watch a Christmas Story on TNT, of course. Well, after spending the holidays in Spain I have come to realize that all of that is a big sham, a mountebankery, a flimflam if you will. And, Spaniards being Spaniards, Christmas Eve is one of the biggest party nights of the year, naturally. While listening to an assortment of Spanish club jamz, there arose such a clatter; I sprang to the balcón to see what was the matter. When, what to my wondering eyes should appear? A street full of Spaniards, like it was any other day of the year. Translated from the tongue of “Holiday Cheer,” shortly after I finished a shockingly delicious, self-prepared dinner (yeah Betty Crocker, I see you) I peered outside of the apartment I was in only to discover everyone and their Santa-hat-wearing brother was out and about tossing back kalimotxo like it was a Thursday in October. Apparently this was nothing to write home about for the rest of the folks I was with, but to me it was about the equivalent of rolling out of bed any given day and finding Pat Sajak in the kitchen making pancakes. It’s taking a normal, average day, then add something completely atypical and extraordinary to it – say Mr. Sajak flipping some ‘jacks like it ain’t no thang, or in this case, streets bustling with Spaniards at 4am. The latter is not an uncommon occurrence in the least, but oh yeah IT’S 4AM ON CHRISTMAS EVE, AREN’T YOU PEOPLE SUPPOSED TO BE DREAMING OF SUGARPLUM FAIRIES SOMEWHERE!? The big guy can have fun too, right? 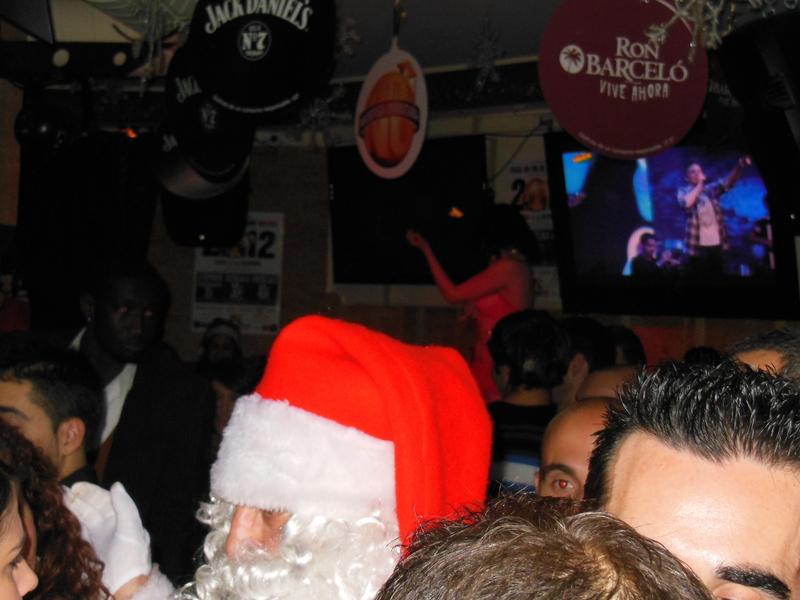 This picture has everything: Papa Noel, a crowd of people, and to top it off, a scantily clad dancer in the background. If that doesn’t scream Christmas, I don’t know what does. However, after having some time to mull it over, the initial level of surprise in regards to this phenomenon has greatly diminished in my mind and has now reached the point to where it is almost infinitesimal. Everything about living, studying and merely existing in another country seems surreal, holidays being one the paradigms of this concept and Christmas being the icing on the Pat Sajak-made (pan)cake. Very few things here are exactly how they are in the States, so why should holidays be any different? The danger of this situation comes when many foreigners often times feel robbed of their own, in this case American, traditions and values. However, I think a more appropriate phrasing is to not feel robbed of your traditions, rather added on to. There’s no need to get angry that people go out until the witching hour on Christmas, nor that most stores are closed during the seemingly vital business hours that are siesta, just take it as it is and go with it. And I may have missed out on Labor Day, Halloween and quite a bit of election coverage, but I did get a long weekend at the beginning of December, got to celebrate New Years two weeks early with 50,000 other students, and a day off from school in November for a continent-wide strike. I think I can live with that. Not to mention the day all North Americans can all agree on anything, let alone a pre-arranged day to peacefully vent political and social frustrations, is the day Chancellor Coombe does the robot at commencement. So, while Christmas was certainly unconventional by my definitions, it’s all a part of this whacky, flimflam-filled, surreal experience called studying abroad. My advice would be to just enjoy it as much as you can, try to learn something and wave to Pat Sajak along the way. Another great ‘story’ about your experiences in Spain! For Christmas, I got cheap holidays in spain 2013 as a present. spent the New Year there. The partying in Spain tends to start later than in many countries. The Spanish tend to stay at home until after the stroke of midnight, though some will make it down to the city’s main square (often it will be the Plaza Mayor, but in Madrid, for example, Puerta del Sol is more popular).